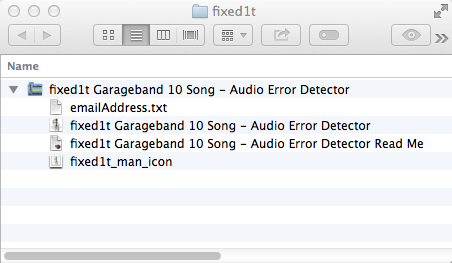 Mac Garageband 10 song files can be afflicted by the dreaded 8-Bit Audio File Format error. This occurs at random in audio files recorded using Garageband 10 and below and stored within the Garageband song files. Unlike with previous versions of Garageband i.e. 11 and below, the 8-Bit Audio File Format error is no longer caused by faulty settings within the 'm4a' sample or effect media files within the Garageband song. With Garageband 10, all such files are now aiff format. Rather than this simplifying the process this has made it much more difficult to indentify and target the damaged files. If the audio samples cannot be fixed or replaced using the technique highlighted above, then the broken audio files and samples need to be identified with the Garageband 10 song, then extracted from the song for further analysis and repair. The software comes as a zip file. The software is available for purchase via PayPal using the pull down list and button below. 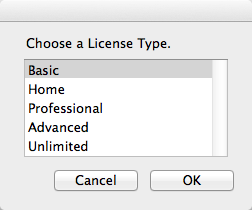 The license type of edition purchased is very much dependent on the size and complexity of the Garageband files the user user is creating and using. The 'Basic' edition is fully working but will display and export a maximum of 5 lines of suspect or defective audio files and samples. The 'Home' edition is fully working but will display and export a maximum of 10 lines of suspect or defective audio files and samples. The 'Professional' edition is fully working but will display and export a maximum of 25 lines of suspect or defective audio files and samples. The 'Advanced' edition is fully working but will display and export a maximum of 50 lines of suspect or defective audio files and samples. The 'Unlimited' edition is fully working but will display and export a maximum of 500 lines of suspect or defective audio files and samples. I do not ship an 'old version' via an automated software delivery service, that requires the user to immediately upgrade the software.